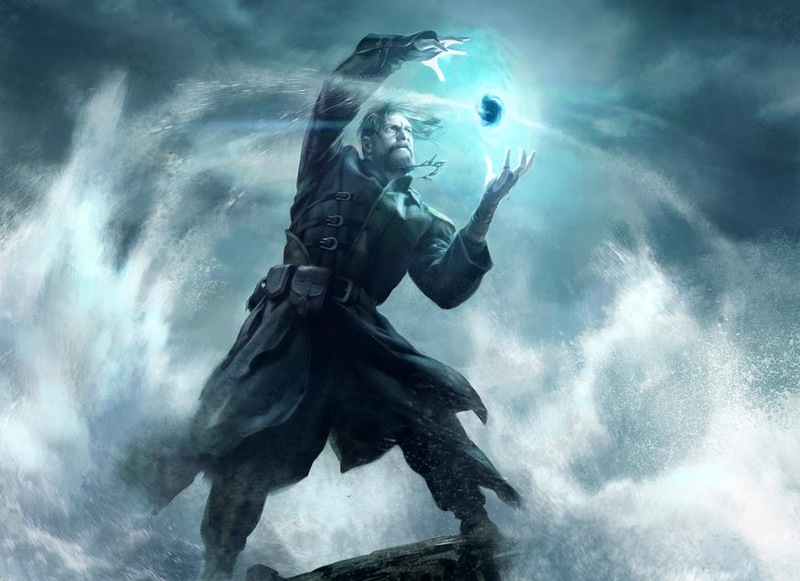 Week #1: Gideon Jura | In honor of the Planeswalker theme weeks celebrating the release of Magic Origins, I'm posting the Gideon sections of Retribution in Ravnica, my multi-chapter fanfic, here as a separate excerpt. Alternate universe where Liliana lost to Garruk back on Innistrad, and accidentally walked to New Phyrexia during her escape, setting off a chain of events with big repercussions, one of which is Venser being alive and well. If you'd like to read more of either the Argentum or Ravnica arcs, just go to the Fiction tab of my blog. In the meantime, enjoy some Jura. “Next.” Gideon Jura, disguised as the cleric Ar-Alan, exercised extreme discipline as he set down his pen and folded his hands in front of his face. He wanted to break something, but didn’t. An ex-mercenary thug turned planeswalking man of God, Gideon was military by nature and followed (for better or worse) a passionately righteous, somewhat eccentric moral compass. Shifting his weight in the unforgiving chair, Gideon wondered if his back was about to go into another spasm. Decades of fighting had begun to take their toll on the planeswalker, and at the moment all Gideon could wonder was why in the Abyss Lieutenant Reed had brought him such a damnable hard chair… and what kind of new cretin would next step up to volunteer for service in the Order of Heliud. Gideon had been posted on Ravnica for some time now. His last major assignment had been to investigate the Purifying Fire of Regatha… an assignment that had gone somewhat awry due to the involvement of a fiery walker named Chandra. Needless to say, Gideon’s employer was less than pleased at the destruction of one of his major temples and Chandra’s escape. The truth was that Gideon had let her go. In fact, Gideon had followed the fire mage to Zendikar, where it looked like she had stumbled upon another magical relic of immense power. The girl was like a magnet for artifacts… and for trouble. Gideon smiled behind his clasped hands and it seemed his headache ebbed just a little. His smile faded as thoughts of Chandra melted into thoughts of the Eldrazi. The Aether-powered titans of destruction had wreaked havoc on Zendikar, and now were possibly loose in the multiverse. Gideon had meant to find allies on Ravnica, walkers interested in re-containing the Eldrazi threat… but all that had happened was him getting embroiled in another petty political mess so common to the city-covered plane. Then Gideon’s employer had contacted him, forbidding him from leaving Ravnica until the “Jace situation” was handled. And so here he was, undercover as a cleric, recruiting for The Order. “Next,” Gideon snapped, his head still resting in his hands. Gideon clenched his jaw to hold back a scalding reply to the Lieutenant, who had been nothing but dutiful since he began his stay at Independence Crown, the official building of Ravnica’s guildless citizens. As a career soldier, Gideon could smell insubordination and Reed stank of it. She hates my guts. She’d dutifully slit my throat in the night, I bet, if she wasn’t white-aligned. Gideon’s anger gave way to mirth and he chuckled silently. Reed reminded him of himself, and he had to admit he was fond of the soldier despite the annoyingly subtle ways she undermined him. Lieutenant Reed had conviction, and that was a quality Gideon could always appreciate, even in his enemies. A disheveled old man fell to his knees in front of the recruitment desk. “What is he doing—” Gideon raised an eyebrow. “Get up, if you would be part of The Order,” Gideon said calmly, his low voice carrying far across the hall. The other would-be Heliud recruits quieted and shifted uncomfortably in line. “No man bows to another here unless it is his superior officer. You are not part of our ranks, so there is no need for—and you have no right to—your current behavior.” The snuffling stopped. A head popped up over Gideon’s desk. It was so sudden that Gideon, a seasoned warrior and veteran of all kinds of awful battles, jumped back in his seat and tipped over his flagon of mead. “Well howdy-dowdy CLERIC Arlane!” The old man was beaming at Gideon over the edge of the desk with a battered grin and matted hair sticking out in multiple directions. Reed snapped her fingers for the custodian to clean up the mead. Gideon looked at the volunteer in front of him. Silently, he brought a righteous curse down upon Nicol Bolas. Turning his scrutiny away from Damir, Gideon motioned to Lieutenant Reed. “Sir?” the Lieutenant stepped forward with alacrity. “Do it again, then, Lieutenant.” Gideon smiled at the young soldier. She returned his look with an icy nod, and walked briskly away. When she was on the other side of the hall, Gideon turned back to the old man in front of him. “Well I was doin’ my magic, sir, and in one of tha holes, this little bird appeared. It looked at me and turned its head like this—” Damir cocked his head to one side and crossed his eyes. “—And I was curious, never havin’ seen one of dem before, so I just asked it congenially like, ‘hey birdie, now what’re you called, huh?’ and the thing kinda made a clicky-beeping noise, but in mah head I heard the word myr, just like that! Ain’t it something? None of that rabble believes me, o’ course.” Damir waved a dismissive hand back at the line of volunteers. Independence Crown looked as ridiculous as ever, flaunting the kind of geometric architecture that only the marginalized think of as appealing. 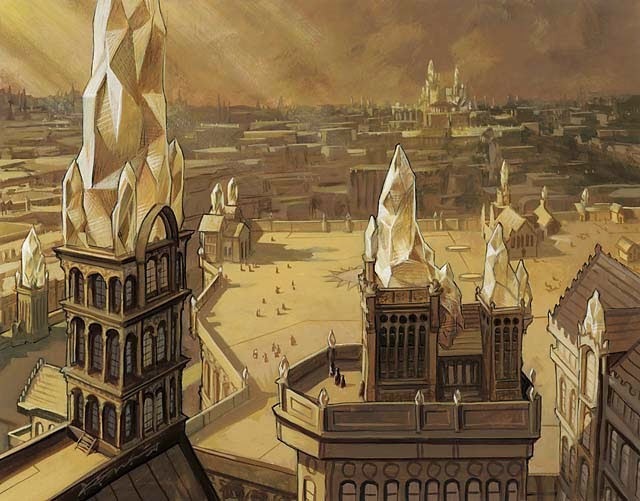 The semicircle of robust shapes housed all of the governmental and administrative buildings for the Guildless Territories, but something had changed since Liliana had last seen it—and unfortunately the change did nothing to improve Independence Crown’s aesthetics. Hanging over the main entrance to the compound and all over the badly spaced windows were banners. Heavy banners, made from tackily shiny, cheap fabric. They were emblazoned with the symbol of a flame within a circle done in equally tacky, shiny cheap gold thread. Banners of The Order. The Order of Heliud. The righteous finger-wagglers had finally come to Ravnica, and Liliana knew exactly which two planeswalkers were to blame. Liliana entertained thoughts of poxing all the gauche fabric into black ash, and she liked the idea so much her hands began to tremble with swamp-fueled spells. But, that would get her nowhere fast in the upcoming negotiations, so she set a smile on her face and flounced up the steps of Independence Crown. Opal Treakoff’s green eyes and wispy hair were gone, and Yolanda Muirrh’s purplish-blue eyes of alexandrite and ruddy curls in their place. Gateless sentries barred her way—politely. “A meeting with Cleric Ar-Alan. I am expected at eleven-thirty. I believe I am a few minutes early.” Liliana smiled at the young male soldier and he gulped and looked away, apparently unable to cope with being noticed by the beautiful Sovereign. “Y-yes, sir,” the young man replied, raising his head resolutely and giving the lieutenant an overly stiff salute. A faint flush rose on his boyish cheeks. Ah, so he’s enamored with his superior officer, Liliana thought. How sweet. The tall doors of Independence Crown swung open after Reed traced a runic code into a hidden panel. A long colorless hall that held several more levels of blocky stairs was lit modestly by glowspheres. Liliana guessed that Ar-Alan’s office would be on an upper floor. She was right. With a grim smile Liliana followed Reed up the awkward and breath-consuming steps. How people function in dresses like this on a permanent basis, I’ll never know. By the time they reached the correct floor, Liliana was sure her curls were drooping and she felt a rivulet of sweat trickling into her cleavage. The lieutenant, perky and fresh as when they’d started the climb, was smiling chivalrously at “Lady Muirrh” as she held open a heavy door that led into another chamber. Yeah, you try looking so dapper after doing those stairs in twenty pounds of clingy skirt Liliana sulked inwardly, though she could tell that Reed was in peerless physical condition from the way the woman carried herself. “This is Crown Hall, and the Cleric has had the honor of taking the largest guest suite as his personal office,” the lieutenant said as they crossed beige floor and passed beige walls whose windows looked out into gray sky. Liliana approved of how this soldier said it--as if the Gateless government building deigned to allow the cleric to stay. It showed loyalty to the the spirit of the Territories, where independence and equality were supposedly valued over all else. Reed spoke as if she firmly believed a holy cleric needed to be approved and vetted by the unguilded just like anyone else. But then, Independence Crown is covered in Heliud’s banners. There must be a strong following for the religion amongst the government officials. Perhaps that was due to this cleric’s persuasive tactics, Liliana sneered. She’d soon find out. Reed said it completely neutrally, but Liliana decided she was liking this lieutenant more and more. “Here we are.” They’d finally crossed the expansive, domed Hall and reached a simple but well-crafted door along the southern wall. There were several other similar doors, all of which Liliana presumed served as quarters for high-ranking individuals who worked in Independence Crown on a daily basis. Reed raised her hand and knocked. “Yes?” came a resonant voice from within. Liliana cringed a little as she stood behind Reed, not from fear, but from embarrassment. She rolled her eyes at herself and gritted her teeth. Let’s damn well get this over with—open the door, you whip-flicking boor... she thought. Though really, bore is more accurate. The door clicked and swung open wide. Over Reed’s shoulder Liliana could see a tall, well-built man framed in the doorway. Truthfully, he was probably the best-built man Liliana had come across in her travels. The fine white wool of his cleric’s robes did nothing to hide his physique—folds of soft cloth fell from muscular, rounded shoulders and flowed smoothly over pectorals so defined they could be used as pauldron forms. The man’s face was approaching middle age but still ruggedly handsome, and his dark blonde hair was pulled back from his face into a low braid that peeked out from around his neck. “My thanks, Lieutenant,” he said. Reed nodded and stood aside for Liliana. “Sovereign.” The esteemed cleric extended a hand to welcome her into his office. His face was composed and he didn’t make eye contact with her. “Thank you, Reed,” Liliana said, touching the lieutenant’s arm gently as she glided past. “My pleasure.” The young woman bowed low, and when she stood, she looked Liliana in the face before saluting formally. At least I have one ally in this depressing place Liliana mused as she listened to Reed’s boots clack back across Crown Hall. Ar-Alan closed the door with a reluctant thud. Ugh, we’re alone. Liliana suppressed a grimace as she turned to the holy man, simultaneously touching her right earring. “There’s no way I’m keeping this getup on in here. It’s stifling.” Tendrils of black swathed the necromancer as the Sovereign glamour dissolved. In moments she was herself—black hair cascading freely around her face, molded leather bodice protecting the assets, comfy skirt she could cross her legs in, bare shoulders, and killer boots. “Ahhh, so much better,” she exulted, indulging in a feline stretch before collapsing into one of the cleric’s overstuffed chairs. It was covered in a soft bearskin, and she snuggled down into it, eyeing “Ar-Alan” from beneath half-lowered lids. Gideon Jura swallowed, frowned, and scratched his neck self-consciously, as if the cleric’s robes vexed his skin. He turned toward Liliana… and fixed his gaze out the window. “Oh for Ulamog’s sake, it didn’t mean anything—so, let’s just move on, shall we? Forget it ever happened. Do you have anything to drink in here?” Liliana twisted to eyeball the cabinets near the fireplace, daring them to hide liquor from her. “Drinking is what got us in trouble the first time,” Gideon said harshly to the window. The dull light from the grayed-over sky made his features look old and pinched… a strange contrast to the way the overcast day had only seemed to caress Venser’s face, seeming right at home. “Um, drinking was probably the best part of that evening, if we’re being honest with ourselves,” Liliana sighed. Gideon Jura, righteous mercenary and planeswalker flagbearer of The Order of Heliud, turned from the window and let his sullen gaze fall on the necromancer in his best chair. Gideon had been many things—soldier, instrument of holy war, defender of the helpless on multiple planes, paragon of strength, flame-mage bounty hunter… but he’d never been a coward, or a quitter. “We could try again,” he said to Liliana. “Um, I’m good,” she said. “I knew you were holding out on me,” Liliana laughed, jumping up and sauntering across the suite. The hour was passing. Venser would be at Independence Crown, soon. He’d promised. Liliana knew the artificer well enough to count on that. “I don’t have a lot of time,” she said to Gideon, as she uncorked the brandy. “Not much needs to be said. I’m the backup plan."